what if the VREF-maker prints a different virtual ref? what if the VREF-maker prints something that's not even a virtual ref? in what order are VREF-makers called? what arguments are passed to the vref-maker? VREFs are a mechanism to add additional constraints to a push. They are also the simplest way to add your old update hooks to gitolite -- they'll just work, no coding changes needed. If that's all you need, you should head over to the cookbook and look for the section on "adding your own update hooks". Fallthru is success in VREFs, unlike for normal refs. That won't make sense until you read further, but I had to put it up here for folks who stop reading halfway! Here's an example to start you off. Here's a pictorial representation of what happens, at a very high level, based on the VREF/COUNT/5 rule in the rule list above. To start with, git-receive-pack calls the update hook with what we will call a "real" ref, something like "refs/heads/master", or "refs/tags/v1.0" -- in general, something that starts with "refs/". This ref is sent through "check #2" (please click to refresh your memory if needed). Any rules that specify a refex starting with "VREF/" clearly won't match and are ignored in this check. Assuming that check did not fail, the gitolite code in the update hook then starts looking at each "VREF" rule in the rule list that applies to that repo accessed by that user. For each one, it runs the actual VREF program whose name is given in the word after VREF/. (The rest of the words, if any, along with all sorts of other information, are supplied as arguments). The STDOUT of the called program is captured and any line that starts with the characters VREF/ is taken as a "virtual" ref, and is run through the same "check #2". The only difference is that, unlike for a regular ref, fallthru does not result in failure, but success. Normally, rules deal with branches and tags (which git collectively calls "refs"). The "ref" is a property of the push which gitolite checks against the set of rules. "Virtual refs" are other properties of a push that gitolite can be told to check, in addition to the normal ref. For example, "this push has more than 5 changed files" could be one property. Or "this push changed the file called Makefile" could be another. These properties are represented as "virtual refs" that start with VREF/. (Recall that "normal" refs start with refs/). The simplest way to use them is as additional "deny" rules to fail a push that might otherwise have passed. This is what the example at the top shows. Put your normal ref rules first. These apply to the branch name or tag name that git itself knows about and sends to gitolite's update hook. Fallthru is failure here, which means the ref being pushed must match some rule in this set for the push to succeed. Put your VREF rules next. These apply to the virtual refs you want to use as additional checks for the push. Fallthru is success here, which means the (virtual) ref must be explicitly denied in order for the push to fail. More complex uses are possible, but may be harder to understand. You may want to experiment with the rules to solidify your understanding as you read this. We know where normal refs (like refs/heads/master or refs/tags/v1.0) come from -- they are supplied by git itself when it calls the update hook. Gitolite has to generate them somehow. Fallthru is success, not failure. First, the normal ("real") ref is checked. As you already know, the push dies if the ref hits a deny rule or it falls through without hitting an allow rule. Next, virtual refs are generated and checked one by one. We'll talk about the generaton later, but for the check, a virtual ref kills the push only if it meets an explicit deny rule ("-"); fallthru does not cause failure. Other than that, the checking is done the same way as for a normal ref, viz., as described in the flow for check #2. 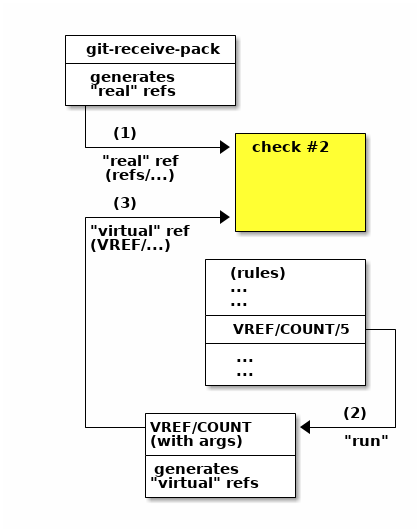 Gitolite uses the VREF rules themselves to help it generate the virtual refs. Specifically, it looks at each rule that contains a VREF (there are 2 in the above example) and calls a VREF-maker for each of them. We'll take the COUNT example rule above. When gitolite sees that rule, it calls the "COUNT" VREF-maker. Specifically, this is the VREF/COUNT program (See here for actual locations on disk). Gitolite passes it the string "5" as an argument (actually, as the eighth argument; details later). If the condition is satisfied (i.e., there are more than 5 files in this push), it should print VREF/COUNT/5 to STDOUT. You can see that when this virtual ref is processed through the rules, it will encounter the "deny" rule, and thus kill the push. Otherwise it should print nothing. That is, there is no virtual ref to run through "check #2", so nothing happens. It should exit with an exit code of zero in either case. If it exits with a non-zero, the push dies regardless of what is printed (see "mimicking a plain old update hook" for why this is useful). If the VREF maker exists with a non-zero exit code, then regardless of what it prints or does not, the push dies. This is just like a plain 'update' hook. Since the first 3 arguments (see later) are also the same that a plain 'update' hook receives, you can actually use any existing update hook as a VREF-maker. Unless you know what you're upto, don't do that. But it's allowed and the behaviour is defined. The VREF-maker for the NAME VREF is a good example. It ignores the arguments and just makes VREFs out of the name of every file that was changed in the push. Here's another example. Consider the problem of not allowing pushes at specific times. Let's say repo 'foo' cannot be pushed between 4 and 7pm, and repo 'bar' can only be pushed before 9am. And of course all this only applies to the junior developers, the poor guys! In this example, we write the "Hour" VREF-maker to ignore the argument passed and just print VREF/Hour/NN where NN can be between 00 to 23 inclusive and of course represents the current hour. If foo is pushed at 6:30pm, the VREF-maker prints VREF/Hour/18, which satisfies the third rule and is rejected. If bar is pushed at, say, 7:20am, the vref printed is VREF/Hour/07, which does not match any of the rules. And fallthru is success so it passes. Virtual refs are best used (1) as additional "deny" rules, performing extra checks that core gitolite cannot. You usually want such extra checks only for some people. When fallthru is success, you can simply ignore all the other users (for whom such additional checks are not needed). RW+ VREF/VREFNAME   =   @userlist   # uggh! what a pain! Worse, since every virtual ref involves calling an external program, many of these calls may be wasted. The VREF-maker can print anything it wants to STDOUT. Lines not starting with VREF/ are printed as is (so your VREF-maker can do mostly-normal printing to STDOUT). This is especially useful if you've turned an existing update hook into a VREF-maker, and it prints stuff meant for the user, but you don't want to touch the code. For lines starting with VREF/, the first word in each such line will be treated as a virtual ref, while the rest, if any, is a message to be added to the standard "...DENIED..." message that gitolite will print if that refex matches and the rule is a deny rule. VREF-makers are called in the sequence in which they appear in the conf file. There are some optimisations to prevent calling the same VREF-maker with the same arguments more than once, and the VREF-maker code for the NAME VREF (which is special) is called only once regardless of how many times it appears but these details should not concern anyone but a developer. Arguments 1, 2, 3: the ref, oldsha, and newsha that git passed to the update hook (see man githooks). This, combined with the fact that non-zero exits are detected, mean that you can simply use an existing update.secondary as a VREF-maker as-is, no changes needed. Arguments 4 and 5: the 'oldtree' and 'newtree' SHAs. These are the same as the oldsha and newsha values, except if one of them is all-0. (indicating a ref creation or deletion). In that case the corresponding 'tree' SHA is set (by gitolite, as a courtesy) to the special SHA 4b825dc642cb6eb9a060e54bf8d69288fbee4904, which is the hash of an empty tree. Argument 6: the attempted access flag. Typically W or +, but could also be C, D, or any of these 4 followed by M. If you have to ask what they mean, you haven't read enough gitolite documentation to be able to make virtual refs work. Argument 7: is the entire refex; say VREF/COUNT/3/NEWFILES. Arguments 8 onward: are the split out (by /) portions of the refex, excluding the first two components. In our example they would be 3 followed by NEWFILES. Yes, argument 7 is redundant if you have 8 and 9. It's just more convenient for scripts to have both available, without having to split/join.